Labour will today pledge to rip up the Tories’ plan for Brexit as it aims to answer critics who claim it does not have a distinct agenda for Britain’s vision outside the EU. Keir Starmer will use a major speech to commit Labour to scrapping the Tories’ two key parliament devices – the Brexit white paper and the Great Repeal Bill – as well as acting unilaterally to guarantee the rights of three million EU citizens living in Britain. The shadow Brexit secretary will continue Jeremy Corbyn’s attack on a “reckless Tory Brexit” as he criticises the “shameful” Theresa May for using EU citizens living here as “bargaining chips”. Corbyn has insisted the general election is about more than just Britain’s departure from the EU but, as May seeks a fresh mandate to see off backbench Tory supporters of a hard Brexit, Labour will set out how it plans to protect workers’ rights and try to capture some of the benefits of the single market and customs union. Drop the Tories’ Great Repeal Bill and replace it with an EU Rights and Protections Bill. 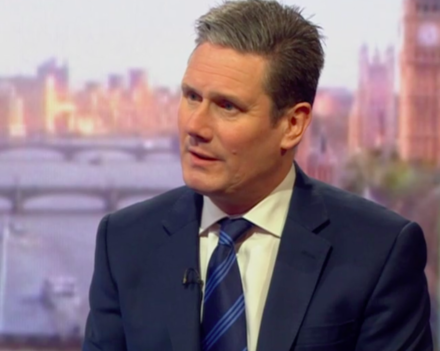 “A Labour government will set out a new Brexit strategy,” Starmer is expected to say today. “We will scrap the government’s Brexit white paper and replace it with fresh negotiating priorities that reflect Labour values and our six tests. The white paper will have a strong emphasis on retaining the benefits of the single market and the customs union as Labour know that is vital to protecting jobs and the economy. “And we will approach negotiations in a completely different way to a Tory Brexit: negotiating for the many, not the few.